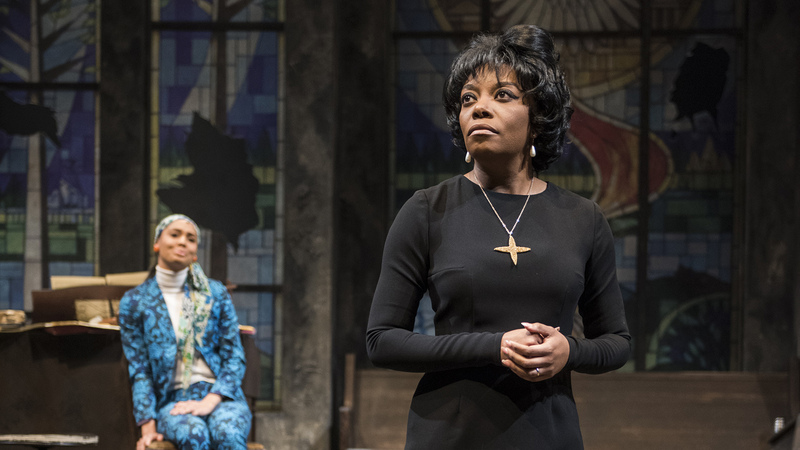 Christina Ham’s play, “Nina Simone: Four Women,” now in a feverishly acted Northlight Theatre production directed by Kenneth L. Roberson, is the anatomy of a song. And by extension, it is the anatomy of the angry, emotionally wounded singer, songwriter, pianist and civil rights activist of the title who wrote it, and who is seen at a pivotal moment in her life. It also is a vivid reminder of a horrific, galvanizing moment in the life of the civil rights movement itself. Yet while Simone refused to suffer the indignities of a Jim Crow society, she did not join in demonstrations or attend the March on Washington held a month earlier. And she had little patience with Dr. Martin Luther King Jr.’s philosophy of nonviolence. The church bombing only pushed her over the edge, driving her to write songs that would set people on fire rather than instill a sense of “We Shall Overcome”-like patience and time endurance. But Ham’s play is no biography. Nor does it have the depth and genius of Lorraine Hansberry’s “A Raisin in the Sun,” which arrived on Broadway in 1959 and already gave audiences portraits of an African-American family comprised of an “old school” mother figure, her fully “woke” college-educated daughter, and her only gradually “waking” daughter-in-law. The next to take shelter in the church is Sephronia (an intriguingly etched performance by Ariel Richardson), the twentysomething “high yeller” activist. A light-skinned woman with a black mother and absent white father, she is scorned by both African-Americans (for her perceived privilege), and discriminated against by whites. Each of these four women has suffered because of the color of her skin and the oppression of black women by both black and white men. Yet they are the bedrock of the race. Overall there is an agitprop quality to Ham’s play. And while Simone might well have had conflicted feelings about “Porgy and Bess” (despite the fact that her recordings of “Summertime” and “I Loves You, Porgy” were among her hits), to suggest that the George Gershwin/DuBose Heyward opera was racist or condescending is profoundly misguided. It was, in fact, ahead of its time, as was Gershwin’s adamant demand that it only be performed by a black cast. And not only have singers from Marian Anderson, Leontyne Price and Audra McDonald tapped into its beauty, but Langston Hughes, the great Harlem Renaissance poet (and social activist) championed it. That said, there are countless reasons to see “Four Women,” and to be reminded of just how ahead of her time Simone herself happened to be. “Nina Simone: Four Women” runs through March 2 at Northlight Theater, 9501 N. Skokie Blvd., Skokie. For tickets ($30-$88) call (847) 673-6300 or visit www.northlight.org. Running time is one hour and 40 minutes with no intermission.